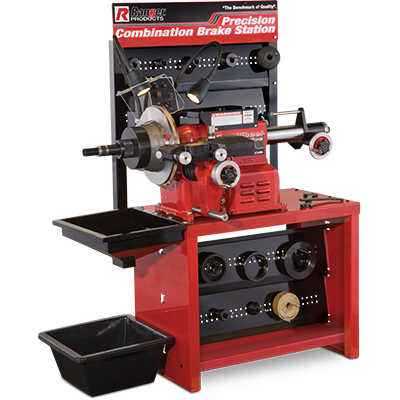 Since its introduction nearly four decades ago, the design of our RL-8500 combination brake lathe has been a favourite of brake technicians everywhere. It's simple, it's fast, it's precise and it runs forever. It features our twin-cutter tool head with micrometer dials and quick drum-to-rotor changeover. The adjustable speed settings allow you to quickly rough-cut rotors or slowly give them a fine, smooth cut. An infinitely adjustable spindle-feed gear box provides variable speed settings, providing finish cuts that meet or exceed factory specs. Our negative rake tooling yields one-pass finish cuts every time, and the standard 25 mm arbour provides you with a multitude of tooling and adapter choices from either Ranger or other aftermarket suppliers. A convenient quick-change tool-head design allows operators to quickly change the setup from drums to rotors and vice-versa. Upfront controls are designed for minimal operator movement. A handy tool tray is located near the front of the machine, so you can keep your favourite brake lathe tools nearby. Includes micro-dial twin tool cutter, boring bar, inside floating adapters, self-aligning spacer, outside floating adapter, centering cones, spacers, double-taper adapters, hubless adapters, carbide cutting tools, 6-sided carbide cutting inserts, 25 mm arbor, arbor nut, backload spring, spare bulb for lamp, illustrated instruction manual, wrenches, high-impact anti-vibration bands and plastic storage case. Our super-duty adapter package consists of an upgraded 22 mm arbour and a wide variety of adapters. This enormous multi-piece set allows you to expand the coverage to handle virtually any vehicle, all the way through full-size commercial trucks.